Last week, I read an article about the Yankees' last game at the Stadium as fans walked on the field prior to the last home game of the season and capturing a moment of baseball history, upon "The House That Ruth Built,” which will no longer exist next season. While many fans have a great expectation, of the new stadium facility, under construction across the street, I wondered how many had the same hopeful expectation about seeing heaven, seeing the LORD Jesus Christ, or even His return to establish His kingdom on earth as it is in heaven. 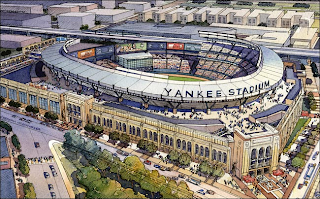 Well, the new Yankee Stadium facility is not the New Jerusalem city the apostle John is talking about, but what he saw, the coming new heaven and earth, it must have been a breathtaking sight! However, here is an event where people were brokenhearted of a building that will soon fade away to rubble and dust and at the same time feel an anticipation of joy waiting for the new stadium to open, where they can walk in and look in awe at what they will see. “But it is easier for heaven and earth to pass away than for one dot of the Law to become void.” Luke 16:17, ESV. Blessed be the God and Father of our Lord Jesus Christ, who according to His abundant mercy has begotten us again to a living hope through the resurrection of Jesus Christ from the dead, to an inheritance incorruptible and undefiled and that does not fade away, reserved in heaven for you, who are kept by the power of God through faith for salvation ready to be revealed in the last time. 1 Peter 1:3-5, NKJV, emphasis mine. Every one of us will one day cease to live here on earth and will enter into eternity, forever, without an opportunity to escape hell or to desire anything more than heaven itself. The choice is ours, the free-will given by God to choose. I know that I would be in awe of seeing streets of pure gold in the New Jerusalem city! Words just could not describe what that sight must actually be like. Those streets of pure gold would never have to be repaved either, there would never be any cracks in it, nor would it ever wear down and have any potholes in them either! The apostle John described the dimensions of the New Jerusalem saying, “The city is laid out as a square; its length is as great as its breadth. And he measured the city with the reed: twelve thousand furlongs. Its length, breadth, and height are equal. Then he measured its wall: one hundred and forty-four cubits, according to the measure of a man, that is, of an angel.” Revelation 21:16-17, NKJV. So how big is this New Jerusalem city? Well, it is certainly bigger than Yankee Stadium. Well, 12,000 furlongs multiplied four times is 48,000 furlongs. One furlong is equal to 220 yards, so 48,000 furlongs would be approximately 1,400 miles. 1,400 miles the New Jerusalem city will be in its length, width and height. And the walls of the city, 144 cubits, would equate to 216 feet in thickness. A wall 216 feet thick and 1,400 miles high and there are four walls of this New Jerusalem city!!! Now that would be a remarkable sight in all of its glory! Plot a 1,400 square mile on the United States to get an idea of the magnitude what the New Jerusalem city will look like. Jesus said that in His Father’s house there are many mansions (John 14:2) and if it were not true, Jesus would have said so and yet, He has gone to prepare a place for every person who has repented of their sins and placed their faith and trust, for their eternal salvation, in Him and Him alone. Yet, many will never see or enter heaven because they have not been born again and instead have the wrath of God abide upon them (John 3:3-7, 36). If a person is not born again, they will be eternally separated from God in hell. The Bible says that in hell, people stand up eagerly waiting for new people to arrive (Isaiah 14:9). And yes, you read that correctly, there are people in hell that will stand up as they wait for the arrival of those who have chosen to reject God’s gift of salvation of grace through faith in the LORD Jesus Christ (Ephesians 2:8-9). The New Living Translation says that those who have been long dead stand up to see you coming, as if you are an important person to be honored for entering hell and to be in their company!!! Who can forget the roaring of the crowd at Yankee stadium when Aaron Boone hit the game winning home run against the Red Sox, to send the Yankees to the World Series in 2003? Is a similar sound heard for the one who enters hell for eternity? I do not know about you, but I do not want hell to be excited about anyone's anticipated arrival! Not even Aaron Boone or anyone else. As you read either of those verses again, is this true of you? Have you rejected God’s gift of salvation through Jesus Christ? Would there be world leaders and mighty kings in hell anxiously waiting to stand up for your arrival in hell? Those who will miss heaven will have done so at the expense of their own selfishness of temporal satisfaction, while ignoring the sacrifice made for them that is their redemption and their eternal security. I could hardly imagine what the sounds would be like for anyone arriving in hell, but I do believe, by faith, there is an exceeding joy in the presence of the angels of God over one sinner that repents (Luke 15:7-10). 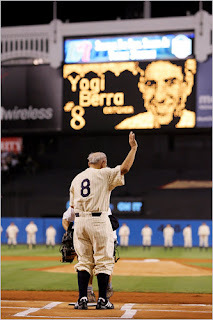 Yogi Berra and the fans may way good-bye to the stadium that has seen some amazing things happen over the years, but none of them, in all of history’s greatest events, will ever compare to the arrival of the King of kings and the LORD of lords, Jesus Christ and the New Jerusalem city. Hey Kurt, I enjoyed reading your blog. Being a Yankee fan I can relate. My sons were sad and watched the entire last game. "It is still not over," says Nicky. "when they tear it down I will cry." I explained to him that we will have a bigger and better stadium. He said "But there are so many memories there." It is the memories that keep us wanting to hold onto the past. It is the fear of the unknown that keeps us from grabbing onto the future. Fear keeps a lot of us from progressing to the people that God made us to be. God says to fear only him, Sirach 41:26-27 "Wealth and vigor build up confidence, but better than either, fear of God. Fear of the Lord leaves nothing wanting; he who has it need not seek no other support; The fear of God is a paradise of blessings; its canopy, all that is glorious." (New American Bible, St. Joseph Ed.) To this day I can't recall ever hearing or reading that if you fear me I will give you all the things that God promises. Even if someone were to try to come close, would they have a leg to stand on? God has proven His word over and over. If our only fear was to fear God, think about what our world would be today. How much more productive and confident we would be. If we fear God that means we fear disappointing him. It means we would trust in Him no matter what. Sadly though we have other fears beside God and that's were we fall. We fear disappointing our peers, family or leaders. We compromise our values and go with the flow. Someone had to get past the fear of tearing down such a historic and legendary stadium in order to make room for bigger and better memories. We need to get past our fear of ourselves and tear down our old way of thinking in order to make room for bigger and better. We need to prepare for our own "heavenly" stadium and that begins with the fear of God and our faith in Jesus Christ. God Bless you, Kim. Great blog Brother Kurt! Keep up the good work and keep praying for me. Nice blog. Yankee Stadium will never be what is once was - however the New Jerusalem will never change. I never calculated how big heaven would be - boy is it going to be quite large. Thanks for passing along the blog and glad to hear all is well at school. My family is doing well as we have hit the new school year running. Kurt, once again you inspire!! I appreciate the euphemistic application of the old and new Yankee Stadium to the New Jerusalem City. Simple faith. How frustrated God must be that we have such faith in ourselves in that the new Yankee Stadium is not even completed and yet ticket sales are so far advanced as to already be difficult to obtain. In our 'blind' faith we believe that the new arena will be superior, more solid and beautiful only to do the exact same job as the first. Many people; land owners, architects, contractors, team owners, politicians, all had many, many meetings and discussions to reach resolutions on how and when this new stadium would be constructed. Deadlines were decided, and the public was informed. We believed all to be true, because we have faith...in ourselves. If only we had such faith in God. We can see His plans. They're in the Bible. He completed the first 'stadium'. Look at this earth; the perfection that surrounds us, that we take upon ourselves to destroy on a daily basis. But, alas, He has also promised that His new 'stadium' will be so much more the richer, more beautiful and far more grand! Let's have faith in His promises. An earthquake, a tornado, both of which we cannot see yet we believe and know very well, to exist. Either one of these could easily destroy what now stands of the new Yankee Stadium. Would our faith waiver then, to believe that it would be rebuilt? Would more time and effort and more millions of dollars be put into rebuilding or would it be deemed a waste of time? God would NEVER give up on us. That's why He has promised to rebuild. He is the architect, the sole investor, and the only contractor! We only have to believe...have faith. As I "hope" that I will attend a game in the new Yankee Stadium someday, I do, however, have Faith that I will walk down a street of solid gold in the New Jerusalem City! God Bless...and keep the Faith!